alaTest ha raccolto ed analizzato 88 recensioni su Doro 6520. La media della valutazione per questo prodotto è 4.1/5, confrontata con la media della valutazione di 4.3/5 per altri Cellulari. La valutazioni circa schermo e design sono globale positive. In aggiunta, dimensione e portabilità ottengono ottime recensioni. Abbiamo analizzato differenti valutazioni di esperti ed utenti, età del prodotto ed altri elementi. A confronto con altri Cellulari, Doro 6520 ha ottenuto un alaScore™ complessivo di 88/100 = qualità Molto buono. No 4G connectivity, no touchscreen, not waterproof. If all you want is a basic phone the Doro 6520 is a good choice. If you have sight or hearing problems it's even better, just don't expect to do much more than talk and text with it. The Doro 6520 is a simple phone, aimed at people who don’t need all the bells and whistles of a smartphone, and instead just want something basic to call and text on. 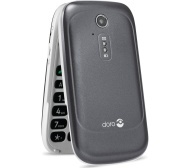 The Doro 6520 is the latest clamshell â€œeasyâ€� phone with added features aimed at the needs of the elderly and frail. It offers greater security to them and peace of mind to their relatives. The Doro 6520 has been designed for use by those who could be considered silver surfers especially those who would benefit from the large text option and range of audio features. Currently this product is available from Argos priced at £79.95. I bought this last month and I like it. Nice phone but it does not seem to be strong enough and it might not last long. "As a basic phone it is very easy to operate. However the instructions for emails and connection to the internet are totally lacking in information and useless."